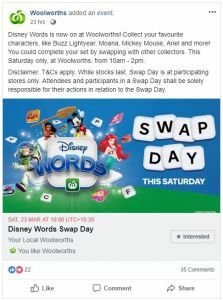 Woolworths will be hosting a Swap Day for its Disney Words promotion. To help collectors finish off their sets, the swap day will be held at most Woolworths stores, excluding some metro areas, on Saturday 23 March between 10am and 2pm. The Disney Words promotion first hit stores in late February. It features 36 tiles for customers to collect, with one tile given out for every $30 spent in stores or online. 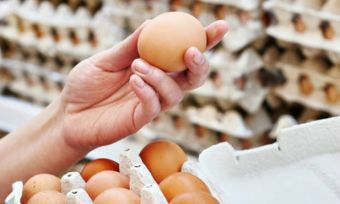 In total, shoppers would need to spend $1,080 on groceries to collect them all! That being said, you’re likely to end up with a few double ups, and this is where the swap day comes into play. The Disney Words tiles feature characters from some of Disney’s most loved films, including Toy Story, Moana, Frozen and The Incredibles on one side and a letter or symbol on the other, which can be used for multiple word play games. A ‘WILD’ tile that doesn’t have a letter on the back can be used in place of any letter you’re missing. Woolworths shoppers also have a chance to instantly win 1 of 10 VIP trips for four people to Disneyland Resort in California by finding a ‘Disneyland’ castle tile. “Collect your favourite characters, like Buzz Lightyear, Moana, Mickey Mouse, Ariel and more! You could complete your set by swapping with other collectors,” says Woolworths.